It was a pleasure to have the opportunity to be a part of Lara’s Quinceanera and to work with Deborah, the mother of the birthday girl. It seemed that from the start, Deborah knew exactly what her daughter wanted at her birthday party. 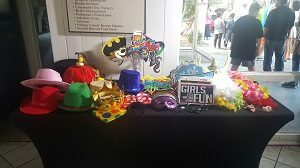 The Quinceanera had an 80s theme to it and Deborah found the right vendors and had the right skills to make her daughter’s party feel like their guests walked into a time machine and into the 80’s. From the moment I walked inside the venue in orange county, I noticed blow up boomboxes on two stand, guests wearing clothes from the eighties, and the DJ already making the guests feel the groove. From that point on, I knew my attendant and I walked into another fun Saturday night. Lara’s friends and family treated us like we were guests. We received tasty food from The Habit food truck and good refreshments. Best of all and what satisfies me the most is everyone enjoyed the photo booth. In the beginning of our service time, guests were busy satisfying their everyday need, hunger. However, as soon as that need was satisfied, the photo booth was busy the entire time. 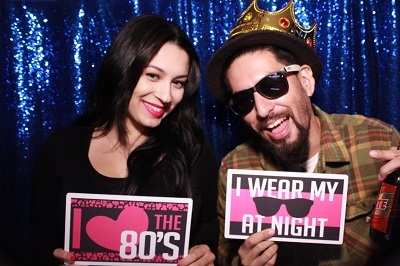 Guests loved our 80s theme props, the 80s photo strip design, and the enclosed photo booth with royal blue sequin backdrop. There’s More to The Fun! Other than 80s props, Deborah also opt in for Scrapbook services. As many of you don’t know, scrapbook services come with double prints. Guests received three 2×6 photo strips, while another strip went to the scrapbook. 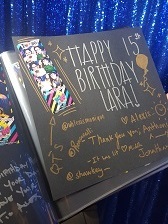 Just about all of Lara’s friends and family wrote a special message on the scrapbook. 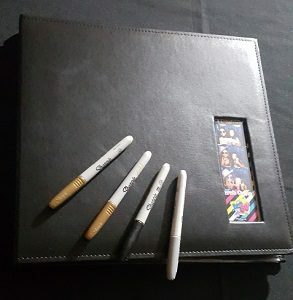 I was told by Deborah that they LOVE our scrapbook services! 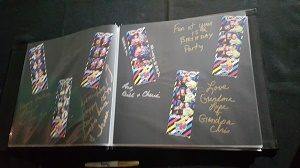 Below you will see photos of their scrapbook. Although ten guests didn’t fit into the photo booth at once like last time, I am pleased I got to be a part of Lara’s Quinceanera. Her parents threw an amazing party and their friends and family were great to us. We hope to work with them again. 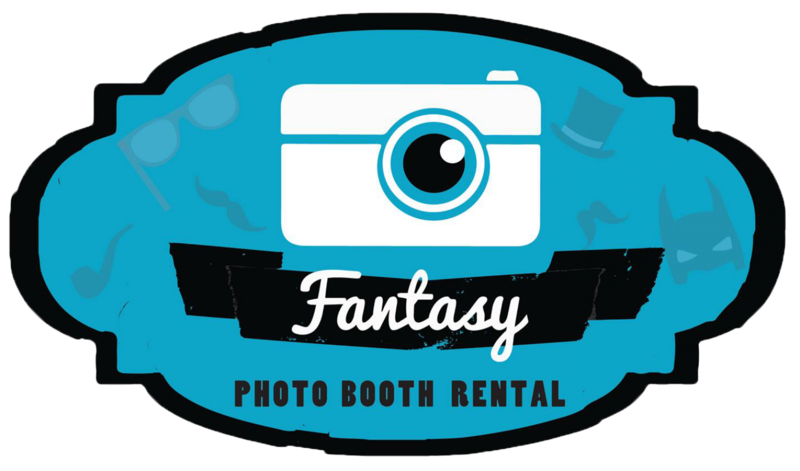 For our packages and information on our photo booth rentals, please be sure to check out our homepage.